As Ireland’s Number One Kids Entertainer, Denzil The Magician provides many different types of shows. Including kids party entertainment and magic shows for childrens partys and special occassions. Denzil caters for all events, sizes and age groups anybody from 1 to 101 will enjoy his entertainment. He is one of the country’s best childrens magician and entertainer. Denzil the Magician’s known for his award-winning entertainment and unique style of magic. Each show includes breath-taking magic tricks, cool illusions and lots of laughter. Not only does he have an amazing magic show he also has energetic music, balloon modeling, comedy. To top it all off he in one of his illusions he produces Benny the live rabbit in his finale. or email him at info@denzilthemagician.com and make your next event an unforgetable one. Denzil the Magician’s specialty is birthday parties and as a kids party magician Dublin. His show is one hour show stuffed with amazing magic. He also provides hilarious comedy, balloon modelling, music and Benny the Rabbit. Denzil is a fan of crowd participation. He enjoys asking members of the audience to help him perform his wacky tricks. Without a doubt Denzil the Magician will treat your children to the best magic experience in Ireland! Whether you are looking for a kids magician Dublin to entertain at a Christening, Communion, Confirmation, Wedding or simply a family get together, look no further. Denzil the Magician can perform a special magic show for your special day. This will keep all of the guests entertained, young and old! Please note for Communions please book early. As the April to May months are in extremely high demand and are often booked one year in advance. Denzil has performed for many corporate clients all over Ireland. Clients from Google, Vodafone, Guinness, Dublin Airport Authority, Porsche Ireland and Accenture to name a few! His magic show is always in high demand. 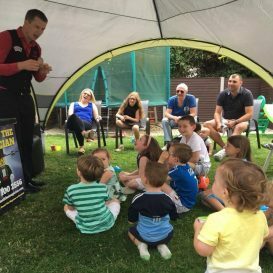 It goes down well for Christmas or Summer family fun days as a kids magician. Denzil also offers adult magic and close up magic for the older audiences at events. Without a doubt Denzil the Magician will provide the best entertainment possible for your corporate event. Often you may feel like throwing a seasonal party. 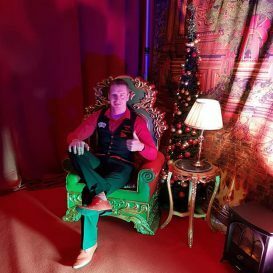 Denzil the kids Magician Dublin offers tailored magic shows for seasonal times of the year. These include such events as Christmas, Halloween, Easter, New Year and much more. If you are looking to entertain your guests at a seasonal time of the year. 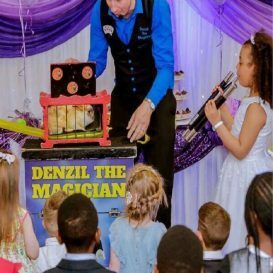 Get in touch and find out what Denzil the Magician can bring to the party to create an unforgettable magical experience for all. 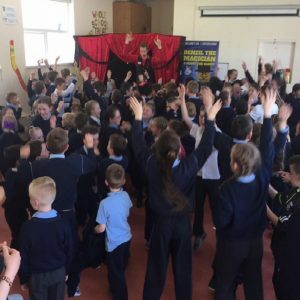 As Ireland’s Number 1 kids entertainer Denzil the Magician is a popular choice among Crèches and Schools. 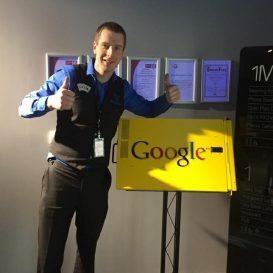 He entertains students all over Ireland. 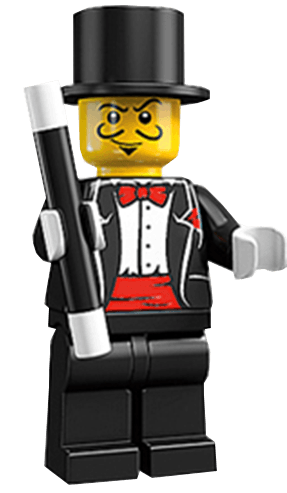 He is known to provide top quality children’s magic shows. Denzil has performed for Christmas parties, graduations, school fun days and end of year parties. His professional backdrop, set and props will turn any school hall into a magical theatre. In return creating lasting memories for all in the audience. 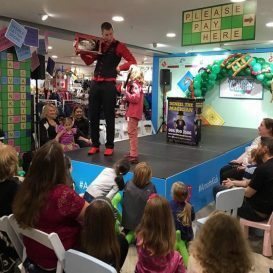 Denzil the Magician has been booked for many shopping centres, festivals and family fun days all over Dublin and the rest of Ireland. He can provide an engaging show with amazing magic and hilarious comedy. This entertainment always draws a large crowd creating an incredible atmosphere. Denzil the Magician has performed in some of the nations largest shopping centres and department stores. These include Liffey Valley, Blanchardstown, Arnotts and Brown Thomas.